We recently discovered this premium breathable silicone barrel bung and were immediately impressed with its robust design and features. To start with, the built in tabs really help make bung removal effortless. But where the bung really shines is in its two-piece design. 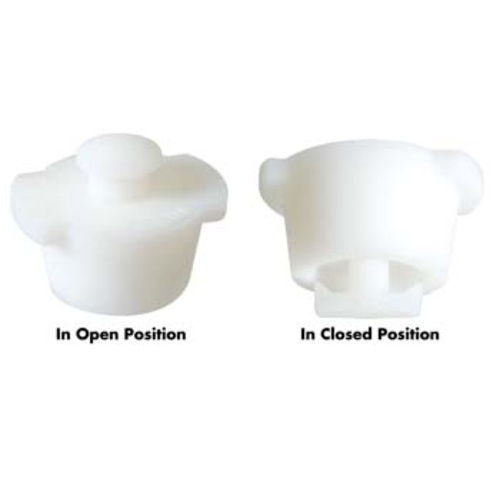 When set to the open position, the bung acts as an airlock and allows the release of CO2 while maintaining a seal against oxygen coming in. This makes the bung ideal for alcoholic or malolactic fermentation in barrels or tanks. When fermentation is over and you no longer want the bung to "breathe" out, you just push the center cap into the bung to create a firm seal and the FE497 becomes a solid stopper! Great for venting and fermentation. Dual purpose product and easy to clean. perfect fit for most 5 gallon barrels. work great. I needed an airlock for some barrel-aging. These have the best design. back up for var. vol. The Vadai barrels come with a wooden bung that does not seal. The silicon bung that "breaths" works very well. We use the breathable bung for our barrel aged spontaneously fermented Belgian style sours, aka lambics. The bung is really well designed. It provides enough counter-pressure (even when in the open position) to not let any air in when the fermentation is inactive, like during colder periods. 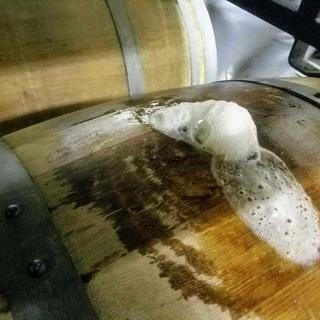 The fact that it is easy to clean is really good as a highly active fermentation will push the foam and yeast through the opening (see picture). The bung does its work as the spontaneous fermentation kicks in for our Belgian style lambic. works as descibed. fits snuggly in the 3, 59 gallon wine barrels I am using. These bungs work great and eliminate the need for bubblers on my still fermenting barrels. These are great for spirit/wine barrels 15G or larger. Easy to clean though they do get stained over time. The Bungs fit great! It is always nice to know it will release any pressure if any fermentation takes place, no barrel explosion potential. Fit perfectly. Easy to clean. My new go-to bung. We gave these a shot on two cask, so easy to use. Not only do they fit great but interim tasting is easy with the center vent. Smacked it in with a mallet then popped the center piece in for a fabulous fit. I now use these on all my barrels. Supper easy to use and works well. Use them open or closed. Perfect in 225L wine barrels and 200L liquor barrels - allows venting when needed. Great bung that allows venting! Not too much to be said about this bung, but it works great in the 225L wine barrels and 200L whiskey barrels we use in the brewery. The vent plug comes in extremely handy especially for finishing fermentations in the barrel, and doesn't seem to have an effect on oxygen permeability as far as I can tell. This is a nice stopper. But it does not even come close to fitting the 23 liter Vadai barrel, as recommended by this site. No reflection on the quality of the product though. Too big or too small for 23L?